The Geopark is framed by the southern slopes of the Pyrenees which, together with the Alps and the Himalayas, belong to the Alpide belt shaped along the tectonic plate boundaries which collided during the Alpine orogeny, during the last 250 million years.. The Pyrenees were shaped by the collision between the Eurasian and the Iberian Plates. 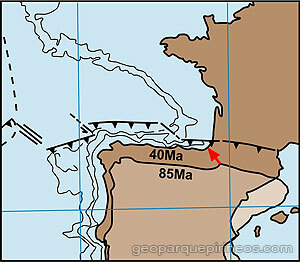 Between 85 and 24 million years ago, the Pyrenees were shaped by the collision of the Iberian and the Eurasian Plates. Nevertheless, tectonic structures related to the Pyrenees extend beyond the mountain range between the Mediterranean and the Cantabric Sea, in northern Spain and southern France, stretching from Provence to beyond the western shores of the Cantabric Sea. From a geological point of view, the Pyrenees domain stretches from the bottom of the Atlantic Ocean, in the Bay of Biscay, to Provence in France, where it meets with the Alps. The most distinctive feature of the Pyrenean lithosphere in its central area is the partial subduction of the Iberian lower crust under the European lithosphere, resembling a layer system formation on the upper crust which represents the seam zone between both plates.